The Caspel is in a good location near the seafront - we had great sea views from our room. The hill up to it can be a bit of a challenge until you get used to it. On the positive side, the rooms were a good size and beds comfortable. Good bathroom and powerful shower. There is TV with Eurosport and CNN in English. The maids do a good job and are pleasant and helpful. They change the beds and towels daily. There was a slight drainage smell in both rooms on arrival, maid sprayed air freshener for us, but we bought our own. The maintenance could be better, e.g. our piped music did not work. There is a nice indoor pool, which was just about warm enough for a swim at this time of year. Unfortunately a party of young French people were in rooms across from ours and were very noisy day and night. There seems to be no sound insulation in the rooms - I witnessed another British guest further down the corridor having a real go at them, but they were noisy as ever soon after. This lasted 3 days and disturbed our sleep considerably. We went half board as b&b was not on offer, and it was a fairly cheap deal. The buffet evening meal seems to be prepared by just one person in the kitchen and is not refilled very often. The food was cold and poor. My other half, the only meat eater, got food poisoning from eating the buffet meat and was ill all night and the following day. I'm sure he wasn't the only one! We skipped the meals in the dining room after that and ate out, although not many places open at this time of year. The food and the noise put us off considering staying at the Caspel again, although a family member stayed there last year and it was fairly quiet. If the bargain price tempts you to go, avoid the evening meal or book b&b - and take ear plugs just in case! Booked with holiday rooms direct. Chose half board because it was cheaper than bed and breakfast. Food was ok but nothing special.The hotel was clean and adequate for a long weekend. No entertainment in hotel. Only a short walk downhill to beach and bars. Just arrived back from this hotel. Hotel was clean and the maid came in every day. We got a good deal on this hotel, and was just as well as we didn't really think the food was up to much, it was also not very warm, so we ended up eating out. There are plenty of eating place to choose from. The most popular bar/restaurant appeared to be Danny Boys, not far from the hotel, which had regular entertainment on. There was a small indoor pool and a gym. Only downside I would say about this hotel is, thats its situated on a hill, was fine at this time of year when the temp was 20deg. but at the height of summer I think most people would struggle. This was one of many long weekends that I have done in Salou over the last 12 months. This time we took my daughter and her 15 month old baby. The hotel is at the top of an inline and is not suitable for anyone who has any form of walking or breathing difficulties. It was very clean and our room which was a family room was very spacious with 2 balconies. The food however was a disaster. Very little choice and poor quality apart from the soups that were very good. Salads were dismal and lacking in selection. Breakfast choice was very limited. We thought the food in all the other hotels we have stayed at in Salou was far superior. The hotel outdoor swimming pool is small with very little sunbathing area. Only 20 sun loungers. The sun did not hit the pool area until 11.30am and then because of the trees a large part of it was always in the shade. The bar ran out of large plastic beakers for pool drinks and this remained the case for the duration of our stay. No entertainment either during the day or in the evening. Not even piped music. We will not stay there again as there are many other hotels in Salou that offer better value for money in better locations. Booked this hotel as was cheapest on offer. Restaurant wasn't very big but lots of choice both breakfast and evening meal. Hotel on a steep incline and not ideal for people who had walking difficulties. Reception and staff very friendly nothing was too much trouble and gave good advice when asked about port adventura and costa caribe tickets. Entertainment was non existent, but plenty of entertainment in surrounding area. Would recommend the hotel and am already waiting to book again when price is right. We travelled to this hotel on a short break with Ryanair and Hotelopia. We stayed here for a cheap and cheerful weekend break out of season. We had full board and the food here is very impressive, there were staff constantly buzzing around cleaning which meant that the hotel was very clean throughout. The staff serving us were very polite and friendly, bearing in mind they work long hours. The hotel is situated on a slight hill which could make it a challenge for older or disabled, but don't let it turn you away as it's worth it when you get there. Entertainment was non existent but what can you expect at this time of year. Booked over the internet for a weekend winter break. Picked the Caspel because it was the cheapest, although the booking was half board we intended to eat out. The food was so good we ate at the Hotel our whole stay. 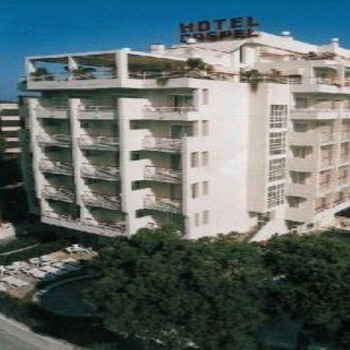 The Hotel was not the most modern in Salou but the rooms, facilities and staff compared to a far more expensive hotel in England they would rate a four star. The Location was very beautiful although I suspect in high season it could be somewhat overcrowded. We were very pleased and had a very enjoyable stay. Booked over internet for short winter break. Picked Caspel as was cheapest. Pleasantly surprised on arrival as hotel was 5 mins walk down to main promenade and was very clean. Food was plentiful and varied despite fact that we were almost the only people in restaurant during our stay. Staff very pleasant and helpful and almost all spoke good English. Room very clean but could have been slightly larger. Dubious about size for longer stay. No entertainment (it was Nov/Dec)but very nice and large bar area with TV and comfy leather sofas and pool tables.